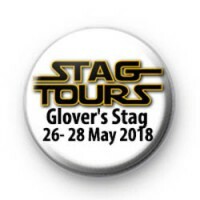 Custom Stag Tours button badge - In the style of Star Wars Classic!. Just let us know the name of the stag & the date of your party in the boxes below & we will customise the badges for you. Brilliant!